Home › Office 365 › Flow › Microsoft Flow – Get to all your site collection details within your Office 365 tenant using Microsoft Flow? 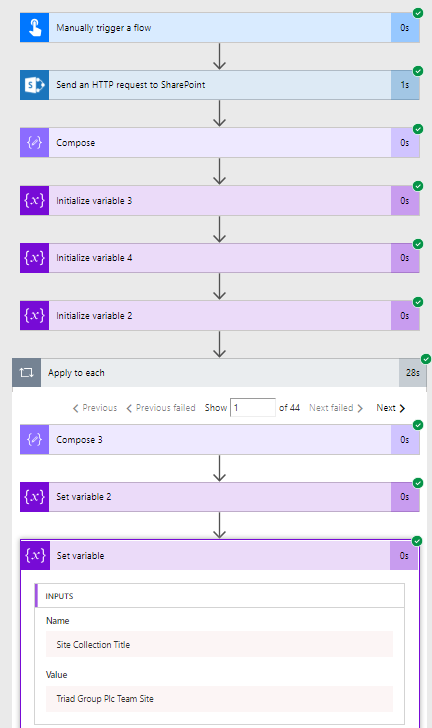 Microsoft Flow – Get to all your site collection details within your Office 365 tenant using Microsoft Flow? After yesterday’s news about the new actions in the SharePoint Connector, today I thought I’ll try and take this a step further. The challenge I gave myself is can I get to all the site collections and collect the details of my site collections using a flow? the answer is yes! First of all I found a list that contains all the site collection information for my tenant. And well the rest is easy! As you can see above it is possible to display the Title of my site. Things like Modification dates, HubSiteId and Site Owners are extracted within no time. And how about Storage Used? All of this information could come handy one day. ‹ Microsoft Flow – Create a new sub site using Microsoft Flow! This is interesting! Can you please let me know how to get the list that contains all the site collection information for my tenant. and then simply go through all of the lists. The list that you need has an empty Title. DO I need to have global admin privileges to get this list? My account just has SharePoint admin rights and I donot see an empty title list. However I see this: DO_NOT_DELETE_SPLIST_TENANTADMIN_AGGREGATED_SITECOLLECTIONS. Can you please suggest? I wonder if this list was renamed. I have found that list now! But the result is empty array. I am pretty sure I am using the current URL and there are thousands of site collections in our tenant. Can you help me on this? I think that you have the wrong list. One of these lists is the one you are looking for. I see the output for Send Http request to Shareoint as above. Is this the expected result? Really appreciate your time and helping me out. I am able to get the result. However I am trying to get the site collection owner names for all of the site collections retrieved. Is this possible using FLOW? Isn’t that the Primary Admin field that you are after? Thank you for the response. Its actually the members in the owner group of a site that I am looking for. How to get the Title from the list of array? How is the set variable action configured?